Someone did a study a while back and quoted something like hard-sided suitcases were a sign of declining civility. What bunk! Hard sided suitcases were the standard until the sloppy seventies came along and some poor sop decided that a duffel back should be used for traveling rather than as something to carry to the gymnasium or on safari. No, even on safari people used gorgeous leather trunks and cases. HELLO?? Out of Africa, people. 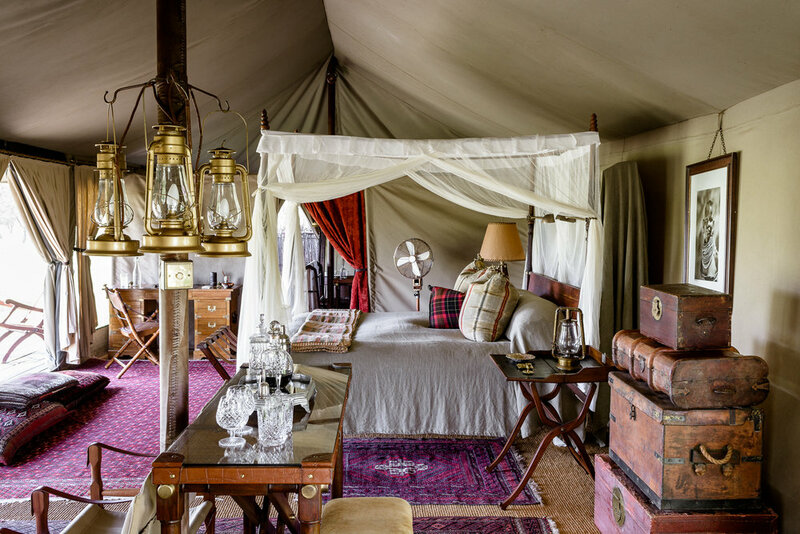 To prove my point, I give you the Singita Sabora Luxury Safari tent. NO ONE is going to throw their backpack on THIS bed and live to talk about it. So if you don’t want to be fed to the lions, consider the many alternatives to grubby, stained, sloppy duffels. If anything, hard sided suitcases seem smart. And the choices are endless. Even UO is getting in on the game. New-ish darlings, Away, seem to have stolen people’s hearts. And Rimowa is always a classic. But a Louis Vuitton trunk is where it’s at. The ULTIMATE in luxe travel gear. However, it’s just not practical when you’re a woman on the go. And who has TIME for managing all those people to CARRY the thing? I may not be able to lift a trunk, but I can definitely carry my own bag just like these toughies can. So after a whole year of trial and error on multiple journeys, I’ve finally chosen two travel bags for different types of travel. Both of them are on the small side, so click away now if you’re not in the market for minimalism. It will not roll away. Commuters, well-seasoned travelers, multi-city visitors know that surfaces around this incredible world are not even or level or smooth. It’s got four double wheels all right and they’re quieter than a whisper in a vaccuum sealed room. BUT THERE’S ALSO A WHEEL LOCK. Thank God, because I didn’t lose it around a curve in the L-Train in Manhattan, and it didn’t go rolling into the elderly woman beside me on the ramp in Grand Central. It stays put with the gentle push of a button. No furtive glances and pulled attention. Click it and stick it, y’all. It’s secure and the TSA secure lock is on the side rather than the top, so you’re not going to scrape your knuckles on the thing or mistake it for the handle. It’s smooth moving with four double wheels that are as silent as the grave. (Mentioning “grave” along with suitcase reviews might seem morbid, but hey if you’re going to “head west”, let’s hope it’s as silently as these wheels.) They’re like the Toyota Hybrid of roller wheels. You’ll never be clicking or clacking your way through a last minute museum visit or restaurant stop. It’s scratch resistant. With a polycarbonate shell and a ballistic nylon overcoat, the surface has a concave-convex texture, which prevents scratches and keeps scratches unnoticeable. One note about this material, it breaks down in constant heat, so store your suitcase in a climate controlled area. I know, but still. It’s lighter than the Away. I tried the Away suitcase with a battery and without and this Muji case, even at a couple liters less capacity, seems larger. Which means this gal with old lady shoulders can actually get the thing into the overhead compartment (“Wheels first please, madam.”) without having to ask the burly dude, in the seat I really wanted, to get up and help me with it. Although, I might ask anyhow, because sometimes I just feel like using my lady powers for personal gain. (Don’t hate.) Doors, heavy things, jewels. I draw the line at furs though. Faux only! Oh gosh, how did we end up here… onto one other bag. I know I just went on and on about not carrying a duffel bag, but this is different. No, really. It’s a suitcase AND a backpack. The thing has never ending space. Just think of it as a weekender to fling in the back of a car or truck to hit the road with. It comes in seven colors but I chose black. Obviously. I’m a Scorpio. The orange one has the best detail photos though, so check this out. Hidden Laptop Compartment where it’s padded and safe and you can have your entire bag opened and people won’t know it’s safely stowed inside and out of view. Junior version fits under the seat for when you fly super cheaply and don’t purchase overhead bin space. The Junior is 19” high and the regular Weekender is 22” in case you’re deciding on size. 3 Handles AND backpack straps so you can carry it like a suitcase or wear it like a backpack. The straps stow away cleanly so you wouldn’t even know it’s a backpack. Again, for when you’re popping into the shops or lunch before leaving, it’s got a good look to it. Organized like nothing else on the market. The front flap opens to reveal an easy access section for notebook pens, and everything you want to get to in a hurry. Scarf, sweater, headphones, sunscreen. There’s even a key loop so you’re not left waiting on the curb digging through everything to find them. And because of the internal dividers, nothing shifts in travel. These are the two bags that will be taking me through 2019 in style. Oh, and I chose black as the color for both bags because ALL BLACK EVERYTHING for me when it comes to travel. It’s just the easiest color. So, grab your bag and your pals and get goin’… Happy packing!